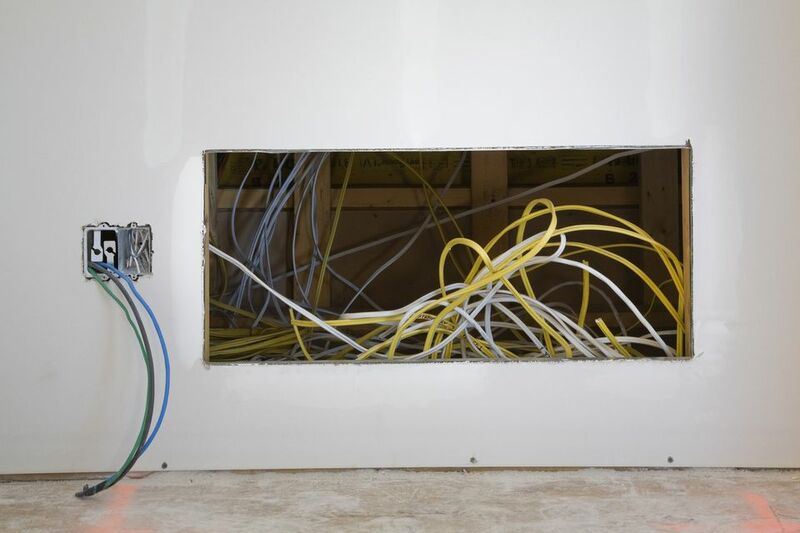 Nonmetallic-sheathed cable is one of the newer methods used for wiring homes. It is a far cry from the good ol' day's method of wiring. This sheath covers the insulated and uninsulated wire within it, but also has a label on its outer coat for identification purposes. From a distance, all wiring may look alike, so how is one to know what size the wire is within the sheath? There was a time when this cabling system placed the wires in a white sheathed covering. The problem was that the different sized wire, say #12 and #10 wire was in the same colored sheath. This led to confusion for the consumer, who often would just choose the cheaper wire, thinking they were the same because they look alike. The danger then was that people were using #12 wire in place of #10 wire, not knowing that the #12 wire is only good for 20 amps, and the #10 wire is good for 30 amps. Because the lighter load #12 wire was used on a 30 amp circuit, fire dangers were a real possibility. To correct this wiring mishap from happening, industry leaders put in place a system where the wire coating is different colors. For instance, the #12 wire is now coated in a yellow sheath and likewise, other sizes are different colors. Now the most commonly used home wiring is colored so #14 wire is white, #12 is yellow, and #10 is orange. That way, there is no mistaking one gauge wiring from another. Simply select the appropriate colored sheathed wiring and its corresponding wire gauge and you'll have the properly rated wiring for each installation. The labeling on the sheath tells the story and it is usually easy to read if you know what the manufacturer is trying to tell you. First, the label tells you the number of wires within the sheath. This is the number of insulated wires used for hot and neutral wires. It does not count a bare wire used for the ground. That is also displayed on the label with a capital "G" or the words "with ground". for example, if the label says 12/G or 12/2 With Ground, that means there are two insulated 12-2 wires, plus a bare ground wire surround by the sheathing. Second, the "12" in 12-2 refers to wire gauge. The "12" is referred to as #12 gauge wire that is rated for 20 amps. Third, you'll see the type of wire that it is. For instance, if it has an "NM", that refers to nonmetallic sheathed cable. "UF" refers to underground feeder wire that is direct burial cable. The fourth and final thing is the maximum voltage rating allowed. If you see "600V", this stands for 600 volts. This maximum voltage rating is determined by the Underwriters Laboratories (UL) and is to be followed for safety.